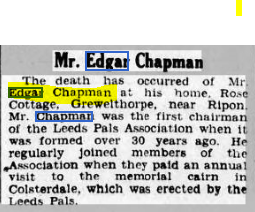 Does anyone remember Edgar Chapman, who lived in Grewelthorpe? This is from a page about the Leeds Pals memorial in Colsterdale. My grand father Edgar Chapman trained at Breary Banks. He was wounded in the battle of the Somme in 1915 and was invalided out of the service in 1919. He retired to the village of Grewelthorpe, not far away from the memorial and every year sometimes with my Aunt Eileen his daughter he would go along and clean the memorial before the annual service at the site. Edgar died in 1952 a brave man who served his country under terrible conditions. He was great man and I loved to be in his company and I was very proud to have been his friend. Richard Chapman, grandson now living in New Zealand but visit Yorkshire most years. Edgar also gets a mention in the Yorkshire Post in an article about War Memorials in Yorkshire. Until his death in 1952, Edgar Chapman of Grewelthorpe, who served with the Pals and was wounded on the Somme, took care of the stone tower, ensuring it was in good order for an annual service on July 1. Report in Yorkshire Post & Leeds Intelligencer 21 Feb 1953. Report in Yorkshire Post Feb 1953. Report in Yorkshire Post & Leeds & Intelligencer 22 April 1940. Silver wedding of Chapman / O’Neill. 22nd April 1915. Edgar Chapman to Teresa O’Neill Present address Grewelthorpe, Ripon. Report in Yorkshire Post & Leeds Intelligencer 22 April 1940. April 19 1940 at St. James’s Church Grewelthorpe. Leading aircraftman G.B.CHAPMAN. RAF. only son of Edgar Chapman of Grewelthorpe. married JOAN FRANKLAND. Youngest daughter of H.H.Frankland and the late Mrs Frankland of Grewelthorpe. Report in Yorkshire Evening Post 27 Dec 1941. Dec 21st 1941 St. James’s Church Grewelthorpe. Wedding. Cadet W.B.Bielby RAFVR only son of Mr & Mrs John W Bielby of Bishop Monkton to Edith Margaret [Peggy] Chapman elder daughter of Mr & Mrs Edgar Chapman of Grewelthorpe.